Lifesaving stations, also referred to as surf stations were built five to ten miles apart from a nearby lighthouse. Where the lighthouse keepers and their assistants were only allowed to attempt rescues near the proximity of the lighthouse, lifesaving stations covered a much more vast area and could assist a larger number of distressed survivors on a wreck a distance from the shore. Lifesaving station keepers were usually professional fishermen, or were directly involved in a particular maritime occupation that had provided them with a vast knowledge of the local area and terrain. Their crew consisted of experienced local mariners and fishermen, mostly volunteers, to assist in training and rescue efforts when the New England weather was the most dangerous from Autumn through Spring. These men were called “surfmen” as they got their name from launching their heavy lifeboats into the thunderous surf. They were also proudly referred to as “soldiers of the surf” or “storm warriors.” These surfmen completed many successful rescues because of the nearly daily training drills they performed in using the equipment and rescue procedures, and would go out on daily shore patrols covering over five miles from either side of the station to keep an eye out for stranded wrecks. 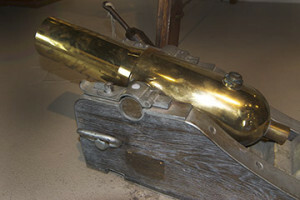 Lyle canon used for rescue efforts. Surfmen had two means of rescuing people either on board stranded vessels or near the shores. 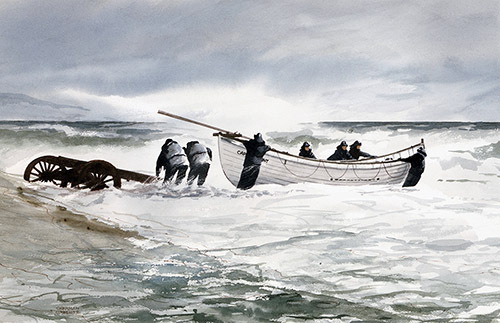 They used an extremely heavy lifeboat pulled on a cart either by horse, or by the men themselves, to a site near the wreck where it could be safely launched into the surf along the shore. This lifeboat weighed nearly half a ton and was useful in all kinds of weather. If a ship wrecked too close to shore to use the lifeboats safely, the surfmen would use a nearly 200-pound small cannon like gun, called a lyle gun, which when fired, would send a line out to the wreck up to 800 yards. 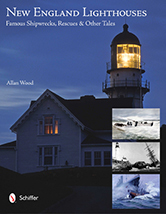 The stranded sailors would secure the line to the wreck, and then the other end would be securely fastened by the surfmen to a sturdy high post, boat, or rock along the shore. 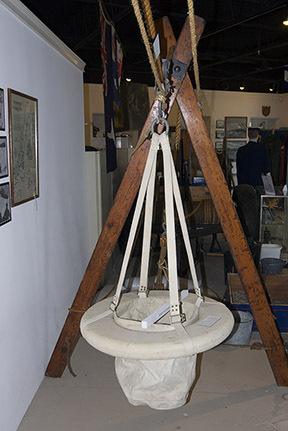 Breeches Buoy used in rescue efforts. A surfman’s daily routines consisted of drills in using the lifesaving equipment on the beach or rocks, and shooting the lyle gun at a practice pole as if it were a ship’s mast. In a perilous rescue attempt, if a lyle gun could not be used, the surfmen would have to resolve to wading waist deep into the dangerous surf and use a heaving stick to try to get a line aboard the ship. One of their other pieces of equipment was a breeches buoy, which looked like a life preserver with canvas pants attached to catch the survivor so he or she could be towed ashore. The unofficial motto of the surfmen was that “you had to go out, but you did not have to come back.” Many surfmen risked their lives to save shipwrecked victims, and some received Lifesaving Medals from the Government for performing their duties under extreme conditions, or from the Humane Society itself. They were the most trained and experienced boaters to launch in all kinds of weather and perform their duties, at great risk to their own lives.